OK, so bad pun but the pictures completely make up for that, don’t they? I have a confession; I don’t like winter and that is mostly because I do not like cold. And sometimes, I’m just a little bit lazy. My intended pun isn’t actually "’winter’s so fun” but rather “winter’s no fun”. I detest cold; I like snow mostly on Christmas cards or if I am inside, looking outside as it flutters down gently. I don’t like winter driving, or how other people drive in the snow. I don’t like scraping my windows. But my most detested job? Dressing little people to go outside! Hats, scarves, coats, snow pants…but the worst are mittens and boots. I will say that I am very thankful that this year Chloe and John can mostly dress themselves. That makes life much easier. On the other hand, Isaac is still challenging, improving but challenging. Low tone definitely takes putting on snow gear to a whole new level of difficulty! Anyway I have to literally force myself to take my children outside. No part of me wants to move from a warm, comfortable spot in the house to the windy, chilly, snow-covered outdoors. Once we get outside? I sure do enjoy myself. We haven’t had any “snowman snow” this year however we’ve build many snow forts and tunnels, slid down many hills and went for many snow-covered walks. The children sure do love when mama’s out there playing with them! There is memories being made, and bonds being formed. I know it’s integral for me to be a part of their outdoor adventures and I find that once I get out there I really do enjoy it. And it’s worth it, so worth it! Dress for it! You make sure your children are bundled up appropriately so do it for yourself too. This Mama got a beautiful down-filled North Face coat for Christmas that has really helped me to enjoy outside more now that I’m toasty warm! I also wear snow pants, boots and warm mittens. I will not enjoy myself and I’ll be counting the minutes to come back inside if I am not dressed properly. Accountability. I tell the children at breakfast that about our plans; that we are going for a walk, or sliding or whatever. They’ll hold me accountable and remind me (over and over until we go!) to get out there. I tell them first we have to finish our chores/cleaning/ whatever first and I often have children scrambling to get their rooms tidy – just an added bonus. Don’t just be a spectator. If I’ve passive, I’ll find myself counting the moments until we can go back inside. If I have a plan or destination, then I actually get involved. 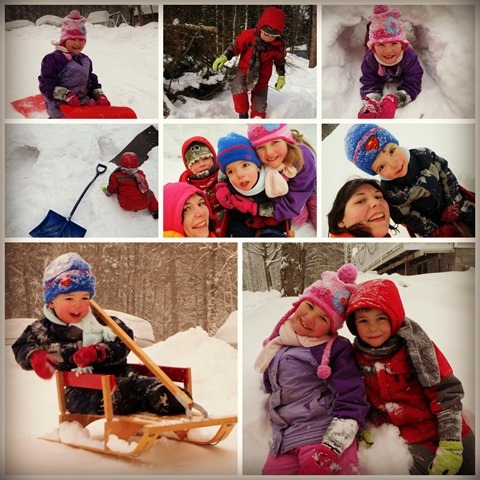 I get involved: I go sliding, I build forts, shovel tunnels, plan a destination for our walk, go on a scavenger hunt for animals, tracks etc.…maybe a post of ‘things to do outside’ is an order? So are you a winter person? What’s your favorite outside activity? This post is under “Just Life, Parenting” and has no comments so far.